Philip Lassiter - Prince, Snarky Puppy, Roberta Flack, et al. When the Panda comes out, every body gets shaking! With the release of their second album, “Pandrenalin”, Pimpy Panda continue their contemporary perspective on Funk, Soul, Jazz and Pop fusion. Shortly after their debut album, “Bamboolicious”, in 2016 it was clear that this Panda would set trembling the clubs and festivals alike. Once again, bassist Daniel Hopf has gathered together his thrilling band, consisting of 9 outstanding musicians and well-known guests such as Kirk Fletcher or Gary Winters. A force that is irresistible on as well as off-stage. “Pandrenalin” is a good reminder of why one shouldn‘t miss a Pimpy Panda concert. At concerts, Panda fans are exposed to some of the most interesting challenges, for example not everyone succeeds in the “Purple Freeze” as it takes an incredible amount of self-control to keep one‘s feet still for even a moment. The new album will also whet the appetite of those curious as to what type of cocktail Pimpy Panda have blended together this time around. Actually as a Soul/Funk band the band functions perfectly well without a brass section, with the exception of the luxurious stylings of trumpetist Gary Winters (Pee Wee Ellis, ABBA, Lenny Kravitz…) on the hit track, “Es geht los”, or with the bluesy sounds of Kirk Fletcher (Joe Bonamassa, Eros Ramazotti, Fabulous Thunderbirds,…) which raise the temperature to a higher level. 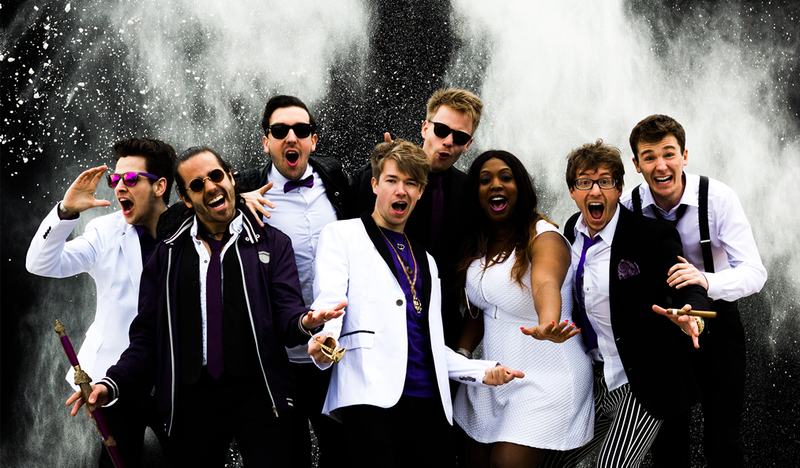 In addition to band founder Daniel Hopf, the cast includes Hammond hammer Simon Oslender (WDR Big Band, Dr. Lonnie Smith, Max Mutzke), former “Voice of Germany” contestant Nico Gomez, with his female collaborators, Alana Alexander, Tina Sona and Lotti Epp. Alexander Lipan and Tobias Mueller provide amazing accompaniment on guitar as featured on “Froot Loops” while drummer Vincent Golly amazes the Pandas and audiences alike. Ten Pandas plus guests equals a tremendous amount of power, creativity, fun and emotion. With radio-compatible songs such as the hopeful uptempo “Don‘t Give Up” and the party starter “Es geht los”, “Pandrenalin” will seize not only your legs but your ears as well. Keep Yourself Updated! Tour dates, latest videos, albums or free downloads. Register now and don't miss any news or Panda-Bonuses around us. See you soon!